7-year-old's family draws drowning girl from water; MDA resuscitates, evacuates to Ziv hospital by helicopter in critical condition. 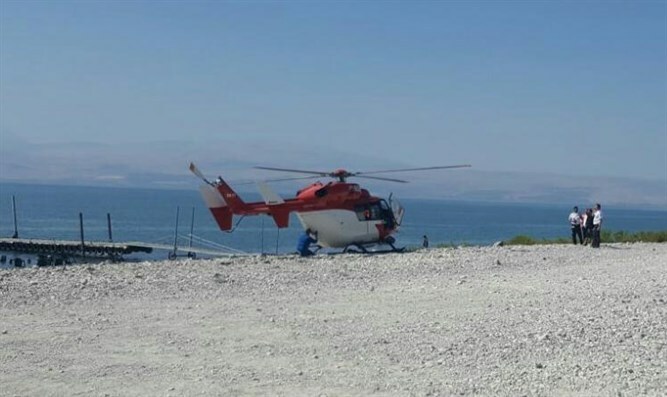 A seven-year-old girl nearly drowned this afternoon (Tuesday) at the Ein Gev beach at he Kinneret. MDA paramedics provided treatment and performed resuscitation. When her pulse returned, the child was evacuated to Ziv Hospital in a helicopter in critical condition, breathing with the aid of a respirator. "I was sitting in a restaurant in Ein Gev when I received a report of a girl's drowning in the MDA responder's application," said Gilad Touasi, who was present at the scene. "I ran with medical equipment to the scene and saw a 7 year old girl lying on the shore after being pulled from the water by family, after she'd spent a few minutes underwater. She was unconscious, with no breathing or pulse. We gave her initial medical treatment, and the MDA ambulance and helicopter which were sent by our hotline quickly arrived at the scene," Tuasi added. MDA paramedic Orly Ben-Semion said, "The girl was without a pulse or breathing after having been a few minutes underwater, we gave her life-saving medical treatment and we performed advanced and prolonged CPR until her pulse returned. After we stabilized her condition, we transferred her to an MDA helicopter that landed nearby and evacuated her to the hospital."